Your advisor’s contact information will be provided in your decision letter. Your advisor will assist you with your program of study and course options. Also included in your decision letter will be your Portal username and password. From Portal, you will be able to register for/drop courses, review your financial aid status, view registration holds, and more. If you have issues with your Portal login, please email the UNA Help Desk at helpdesk@una.edu. 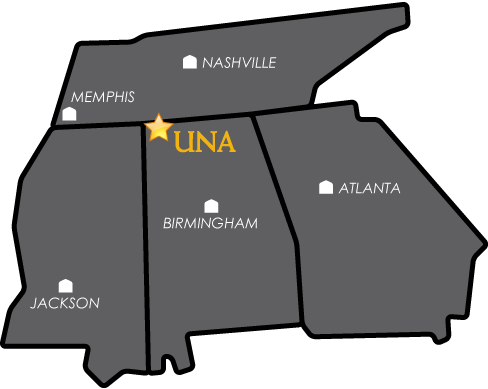 View the “Billing and Financial Aid” tab in your UNA Portal to get started. You will find instructions on how to apply for financial aid, financial aid policies, and more. If you have any questions regarding financial aid, please contact Student Financial Services at 256-765-4278 or email sfins@una.edu. Register for courses online through UNA Portal. Please direct any questions regarding coursework or your program of study to your advisor. For more information about registration, review the Registration Information webpage. You may also view the Class Schedule for a list of course offerings. Be sure to visit our Frequently Asked Questions page for answers to our most commonly asked questions from students!